Redebeiträge unter anderem das auch Chevron/Texaco durch ein Schiedsgericht freigesprochen worden ist, wie es auch bei uns in Europa durch das neue Freihandelsabkommen vogesehen ist. 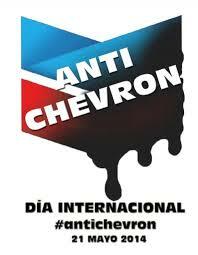 On the international day of action against Chevron we would like to highlight a call for Signatures from the Anti Chevron campaign and a global map of conflicts caused by Chevronactivities. The company operates in more than 180 countries around the world, so this tour is just a sample of the gravest corporate abuses and environmental injustices the multinational has been implicated in around the world. Click on each case to get the full details from the Atlas. The news: One hundred children orphaned by the Syrian civil war could find a home in Uruguayan President José “Pepe” Mujica’s summer retreat, “a mansion and riverfront estate surrounded by rolling pastures,” according to Yahoo News. That would be a welcome sight for any of the hundreds of thousands of refugees displaced by Syria’s political turmoil. The children could arrive as early as September, coming from refugee camps in the Middle East. The UN High Commission for Refugees (UNHCR) does not relocate orphans without a family member; each child would arrive with at least one relative — like an uncle, cousin or sibling. The exact number of children expected at Mujica’s summer residence is still being worked out, particularly since the Uruguayan government will be responsible for all of the expenses. More than 2 million Syrians have fled the country since the conflict began in 2011. Turkey, Jordan and Lebanon have taken in the majority. More than 1 million Syrians have relocated to Lebanon, while 600,000 are in Jordan and 700,000 are in Turkey. Germany and Brazil have granted immigration visas to Syrian refugees, 10,000 from the former and 2,000 from the latter. Notice who’s not in the mix? U.S. President Obama’s administration has been pretty listless in aiding Syrian refugees. Out of the estimated 2.3 million Syrians displaced, the U.S. only admitted 31 into the country in 2013. That number seems even worse when you take into account the fact that 135,000 Syrians have applied for asylum by January of this year. Most applications were rejected because of strict immigration laws instituted to prevent terrorists from entering the country. In February 2014, the Obama administration announced that it would ease up some of the immigration restrictions. According to a statement signed by Secretary of State John Kerry and Jeh Johnson, secretary of homeland security, the U.S. will grant exemptions to Syrian refugees “on a case-by-case basis to the ‘material support’ bar in U.S. immigration law,” reported Reuters. Mujica keeps one-upping President Obama. This is not the first instance where Uruguay’s president has taken the lead. Mujica turned his leftist guerrilla past into game-changing national leadership through several strategic political moves and by capitalizing on an everyman brand. Mujica is known as the sandal-wearing, VW Beetle-driving, farm-living “poorest president in the world.” He donates most of his $12,000 monthly salary to charity and lives in a one-bedroom home, even though a recent report indicates his assets to be well into the six-figure range. Coolness factor aside, Mujica broke ground by making Uruguay the first country to legalize the production, distribution and consumption of marijuana. Notably, he also legalized gay marriage and took in six detainees from Guantanamo Bay, which the U.S. still hasn’t dismantled after promising to do so six years ago. Under Mujica’s presidency, Uruguay is aggressively fighting a $2 billion lawsuit filed by Phillip Morris, since the country’s strict anti-smoking laws force the company to place graphic warnings on 80% of all cigarette packs. And Uruguay now has the most liberal laws on abortion in all of Latin America. Originally, Uruguay’s president planned to consult with the Uruguayan people about admitting the refugees into the country. But Mujica proceeded without doing so and without congressional oversight. “Das nordamerikanische Imperium hat zwei Ziele: Sie wollen die Verbreitung der bolivarischen Ideale verhindern und die Ölreserven des Landes kontrollieren.” – Venezuela wirft USA versuchten Umsturz vor! Während der seit Mitte Februar andauernden Proteste gegen die linksgerichtete Regierung seien 58 Ausländer festgenommen worden. Fast alle hätten Waffen bei sich getragen. “Das sind Söldner auf einer Mission”, sagte Torres. Caracas/Washington – Die venezolanische Regierung hat die USA für die gewalttätigen Proteste in dem südamerikanischen Land verantwortlich gemacht. Die Vereinigten Staaten verfolgten einen Umsturzplan und arbeiteten mit der Opposition zusammen, sagte Innenminister Miguel Rodriguez Torres am Freitagabend.